I think we can safely file this one under #controversial. 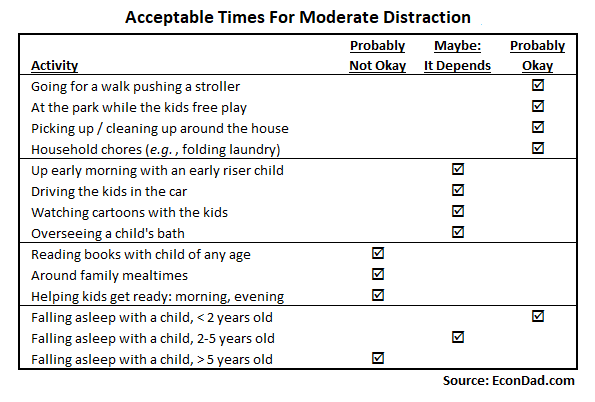 An alternative title might be: “In Defense of (Occasional) Distracted Parenting.” Kindly bear with me and read with an open mind, including the postscript at the end. I have a confession: I often wear AirPods while watching my kids. At times, I’m distracted in the traditional sense: daydreaming or thinking about economics (what a geek!). Other times, I’m choosing to be distracted because I’m listening to a podcast or a book on tape, or maybe talking with a friend or parent on the phone. It’s not every second, but it’s frequent enough that it affects my parenting. I think of it as semi-engaged parenting, moderately present but also with some of my attention elsewhere. Sometimes, you’ll see me at the park, totally engaged with my kids, playing games with them, coaching their soccer teams, chasing them on the jungle gyms, playing cops and robbers, technology completely out of sight and out of mind. Other times, you’ll see me sitting on the bench, ear buds in, listening to Tim Ferriss on high performance, or Seth Godin on business, or Russ Roberts on economics. Sometimes I’m juggling a soccer ball. A bit checked out, a bit in my own head. Letting the kids free-play. Sometimes, I make everyone in the family the perfect breakfast. 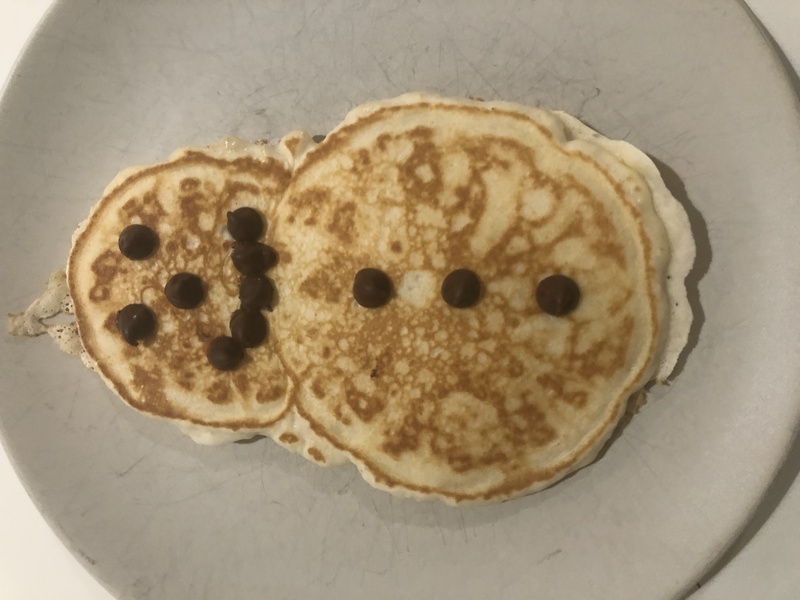 Bacon and milk for my oldest son, smoothie for my second son, snowman pancakes for my daughter, and cereal, grapes, and yogurt for my toddler. I’ll be cracking jokes, laughing with them, and getting everyone ready for the day. Other times, I’ll be in my own world, making school lunches, emptying the dishwasher, cleaning up while the kids scrounge for breakfast. I’ll help them here and there, maybe pour a bowl of cereal, but I’m a bit distracted because I’m listening to Sam Harris explain the nature of consciousness or maybe even watching the entire seven seasons of The Good Wife during breakfast routines over the summer (mostly true story). I tend to allow more distractions when other adults aren’t around, like when my wife isn’t home or when I’m the only parent at the park. That’s usually a good indicator of questionable behavior. Adam Smith’s “Impartial Spectator” would say that behaviors probably aren’t desirable if you’d be uncomfortable with other parents watching (and silently judging you). “Distracted” is a tough term to defend, because being “distracted” is necessarily worse than being “focused” or “attentive.” When I think of “distracted parenting,” however, I don’t mean completely unfocused, I just mean focusing on other things in addition to parenting. And that’s not obviously good or bad; I think it requires some reflection. Economists like to think through both sides of an issue. As in: “On the one hand, [_____]. On the other hand, [_____].” So here goes. On the one hand, my initial gut reaction is “No, it’s not okay” to be distracted or semi-engaged. A starting point of good parenting means being present and interactive with our children — paying attention, listening, and responding with our full focus. A problem therefore arises when the emotionally resonant adult–child cueing system so essential to early learning is interrupted—by a text, for example, or a quick check-in on Instagram. Anyone who’s been mowed down by a smartphone-impaired stroller operator can attest to the ubiquity of the phenomenon… “Toddlers cannot learn when we break the flow of conversations by picking up our cellphones or looking at the text that whizzes by our screens,” Hirsh-Pasek said. I’m also aware that I might be trying to justify semi-engaged parenting in order to feel better about an objectively unhealthy choice. Like an alcoholic who justifies another beer, or a smoker who justifies another cigarette. The difference, I suppose, is that semi-engaged parenting affects more than just me, it affects by children. Maybe future generations will refer to distracted parenting as “second-hand technology” — just like “second-hand smoke,” which we used to think was not so bad but now realize was terrible. If I could be completely 100% engaged with my children at all times, that would probably be best. 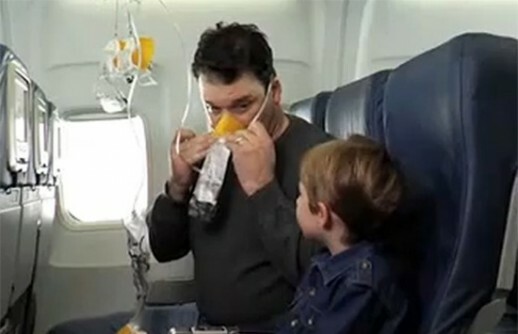 I admire and applaud parents who can do this, because it it probably does benefit their kids. But it’s easier said than done. I’m no superman, but podcasts are definitely my kryptonite. On the other hand, I’m also tempted to say: “Is it really such a big deal?” If my older children are screwing around upstairs playing Pokemon, and my one-year-old is playing with trains on the kitchen floor, does it really matter if I listen to Nassim Taleb explaining anti-fragility or Bryan Caplan making the case against education? I have my own interests, my own pursuits, my own life. “The kids will be fine, right?” If I want to keep my brain sharp, learning, and growing, I’ve got to keep it engaged. I want to listen and think with smart people who have something to say. There’s so much interesting content being created these days, it’s almost impossible not to want to consume more. 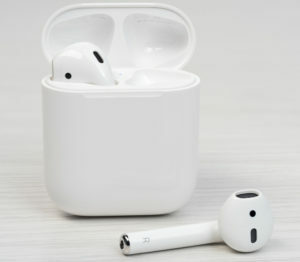 How much harm is caused, really, if I put in my AirPods in an otherwise — dare I say — boring activity? For example: Let’s say I’m laying on the floor next to my toddler’s crib, because he’s scared and can’t fall asleep without me. My son sees me there, he hears me breathing, and he feels safe. Does it really matter whether I’m also listening to Ramit Sethi discuss personal finance? I wouldn’t be talking with my son anyway, since it’s bedtime. Isn’t my presence with him enough, even if my mind is elsewhere? To the fully engaged parent: I hear you and admire you. You have the moral high ground here. You’re better than me if you’re always able to be attentive and focused on your kids. But sometimes, don’t you want to prioritize yourself, just a little bit? How about this: Would you permit parents turn on the radio and listen to music in the kitchen while they make breakfast? How about reading a book? Where do we draw the line? As parents, we have a responsibility to care for our children, to put their needs above ours, to prioritize their health and well-being. Is connecting our brains to the Internet consistent with that objective? Next step in the toolkit: After the “on the one hand, on the other hand” exercise, let’s try to weigh the relative costs and benefits. As an economist, I’m constantly thinking about trade-offs. I’ve previously explored the idea of trade-offs between my kids and me (see Trading Off Your Kids’ Well-Being). When I’m semi-engaged, is it more like a vice, like smoking, where both my child and I are worse off? Or is it more like a trade-off, where my experience is a bit better and his or her experience is a bit worse? If my child’s experience when I’m fully engaged is measured at 100 units (or utils, as economists like to say), what is his or her experience when I’m semi-engaged? Maybe that’s worth 90, 75, or even 50 units? It depends on what we’re doing, of course. Sometimes my lack of engagement comes at a big cost to the child, other times not so much. I fully recognize that, in many circumstances, we both have a better experience by being fully engaged with each other. Duh! But other times, it seems worth thinking about it as a trade-off. Like when I’m pushing a stroller, or monitoring the kids at the park while they play. If I’m more engaged, I’m more likely to listen, laugh, and connect with my kids. If I’m more less engaged, I’m more likely to wander, daydream, and pay them less attention. But whose experience takes priority? How do we weigh my interests against theirs? I enjoy listening, but I understand the drawbacks. 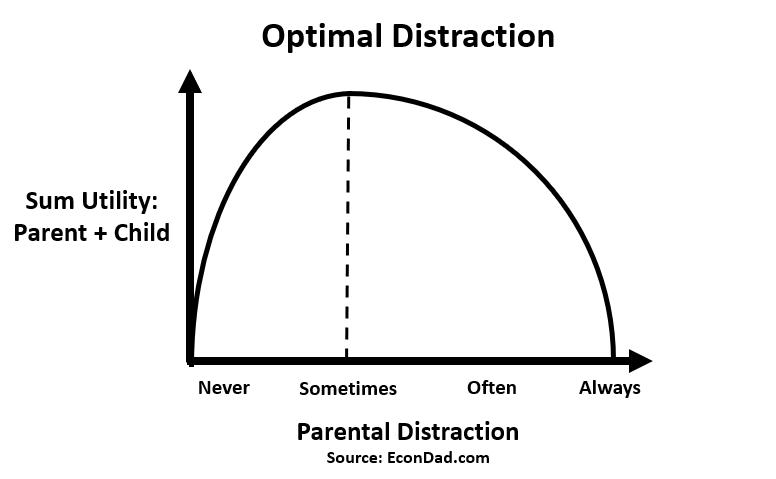 Distractions make me less attentive, less present, less good of a parent. At the same time, outside engagement (in moderation) can elevate my mood, my experience, my life, and provide an adult life raft within a giant sea of children. In that situation, how do we determine the optimal level of distraction? Here’s what I’ve settled on for acceptable semi-engaged parenting: sometimes it’s okay and other times it’s not okay. In trading off my utility with my kids, it’s a judgment call that requires evaluating the specific situation. If I’m reading my child a book, wearing headphones is detrimental to the experience. If I’m folding laundry while the kids watch TV, who’s really being harmed? Short, deliberate separations can of course be harmless, even healthy, for parent and child alike (especially as children get older and require more independence). But that sort of separation is different from the inattention that occurs when a parent is with a child but communicating through his or her nonengagement that the child is less valuable than an email. A mother telling kids to go out and play, a father saying he needs to concentrate on a chore for the next half hour—these are entirely reasonable responses to the competing demands of adult life. What’s going on today, however, is the rise of unpredictable care, governed by the beeps and enticements of smartphones. We seem to have stumbled into the worst model of parenting imaginable—always present physically, thereby blocking children’s autonomy, yet only fitfully present emotionally. 1. 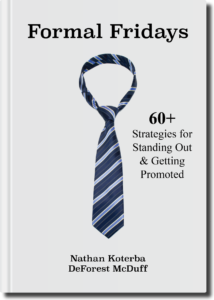 Define clear boundaries between periods of high engagement and low engagement. Plug into the Internet when you’re doing chores and the kids are playing. They’ll be fine. Let them free-play and play among themselves. Then, at separate times, physically remove yourself from your phone and technology to fully engage with your kids. 2. Carve out some activities for acceptable moderate distraction. You can’t be “on” with the kids 24 hours a day. Make some time for them, and also make some time for you. You both have needs that must be met in order to be happy, healthy, and productive. Plan some activities with moderate outside engagement, a podcast or phone call with another adult. Then go back to the kids with your full heart and focus. 3. Prioritize passive distractions over active distractions. Distractions are less disruptive if they’re based on passive engagement that requires limited attention — like music or talk radio. Distractions are more disruptive if they’re based on active engagement that requires high attention — like email, texting, Facebook. When you do indulge in distraction, go for more passive distractions if you’re overlapping with kids. But, as I did some reading, thinking, and drafting ideas on when distracted parenting is acceptable and when it’s not, I actually convinced myself to be less distracted than before. The defense of distracted parenting, it turns out, is actually harder than I thought it would be. In writing up defenses, I’ve been persuaded that it’s mostly indefensible — except, perhaps, when children are successfully minding themselves and/or when the trade-off is minimal. Here’s a telling example: In writing this article, I started observing how connected I felt with my kids when laying in bed with them, with and without AirPods. When I have headphones on, I tend to turn my body away from them, provide colder body language, say very little, and eventually they fall asleep. When I am fully engaged, however, I turn my body towards them, we cuddle, we whisper, and eventually they fall asleep. It’s 200% better, for both of us. I probably won’t go cold turkey. I’m sure that I’ll slip up and act in my own distracted interest from time to time. After all, habits and addictions are hard to break. But maybe, through reflection and critical evaluation of the trade-offs, I’ll put away my technology more often and be more present than I used to be. Readers: I would love your feedback on this one. Do you find semi-engaged parenting to be acceptable in any circumstances? Why / why not? 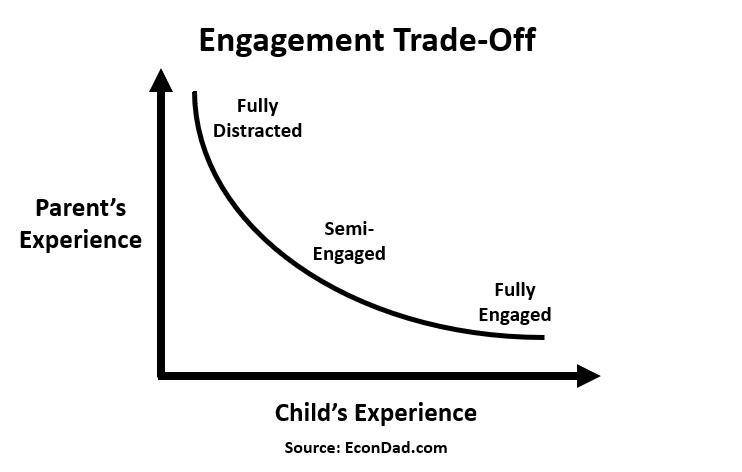 Is the trade-off framework the right one for thinking about costs and benefits of semi-engaged parenting? I think a decent rule of thumb with distracted parenting is whether you would you tune out if you were doing this activity with an adult. Watching TV with friends? Tune in. House guest in the other room chilling? Distract away! Thanks Sara! I agree to some extent. But isn’t this quite an extremely safe and conservative rule of thumb? I would never think of putting on headphones while going for a walk with another adult. But if I’m walking with my one-year-old in a stroller, it doesn’t seem as big a deal. It’s precisely *because* children are not adults that differences exist and distraction is more tempting and arguably acceptable. Just brainstorming — thanks for the thought! I have this debate in my head at least once a day. And, I have this debate with at least one of my children once a day (they love to police my electronic use the same way I police theirs). I love that you establish when it’s ok and when it’s not ok to be distracted, rather than just going through the day mindlessly being distracted you want. I think that has been key for me…chosing my distracted time wisely when its going to benefit me and not hurt my relationship with my kids. Thanks for some food for thought DeForest! Thanks Emily! It’s a constant debate in my head as well. I think you’re smart to have the kids policing you — it’s a good check for reasonable and consistent rules. My kids aren’t *quite* old enough to police us yet, but it’s coming soon, especially when their distraction will be at stake. Better to pre-commit so we aren’t tempted in the moment. No easy answers but all good thoughts! If you are playing with your kids or helping with homework where you are expected to be fully engaged, then you should be just that. Outside of that, it’s perfectly fine to do what you need to do. Is going on technology any different than my dad watching the news every night while we played on the floor or my mom folding laundry while I did homework? I nap at kids movies – it’s dark and comfortable and I’m tired. 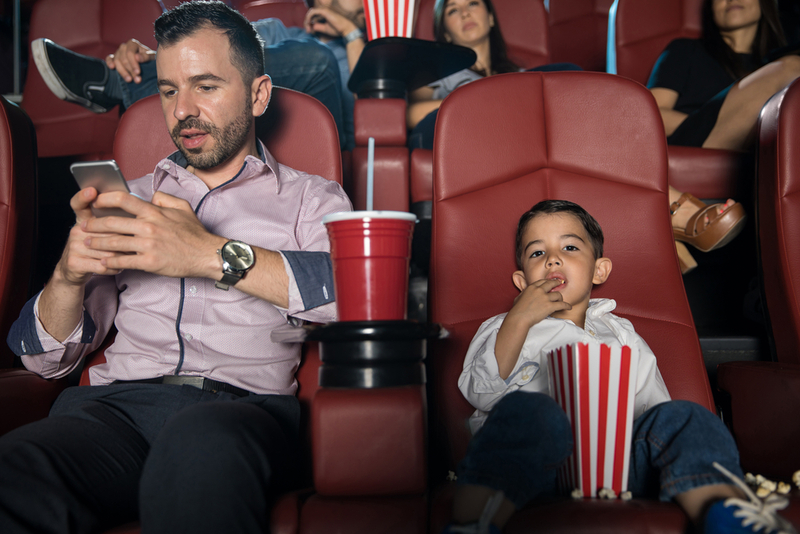 The kids don’t care – they’re at the movies stuffed with popcorn. I don’t think there’s a right answer here, but my rule of thumb is to put phones/headphones aside when the kids can see that I’m not fully engaged, and to use them when we’re watching a movie and they’re oblivious. Phone use hurts kids for at least two reasons: it signals that they aren’t as interesting as a small rectangular device is (which is obviously hurtful over time); and it models a way for them to spend their own time, so they’re more likely to end up using their own phones/tablets (or yours) for hours at a time. it’s a tricky subject, controversial for sure. I like how you approach the topic, and the fact that you’re approaching it! I haven’t done the headphones thing, but what I do fairly frequently is to put my podcasts or audiobooks on the stereo in our living room / kitchen (open concept space) when I’m doing household chores and the kids mostly tolerate it. It has been good for sparking conversation with our older son (although the news podcasts are a bit tricky, because there doesn’t seem one ever that doesn’t discuss some sexual assault case in the last few months). It took a while for them to get used to it. Sometimes they ask that we put on something else, and they’d put on their CDs or we listen to music. That doesn’t address all the complications with distracted parenting / the need for wanting to be mentally engaged or just in our own head, but it works well for some of the puzzle. This is a terrific point, and one that I missed in the article. What is the purpose of headphones? The purpose is so that you can listen without disturbing others. Think about ear buds at the gym. No one else wants to hear your Beyoncé blasting. But headphones cause a rift between parents and kids, if you’re listening and they have no idea that there’s any sound in your ear. Why is Mom / Dad being inattentive? Can’t she hear me? Sometimes we *want* this separation: the kids listen to Thomas songs in the back of the car while I listen to an economics podcast in the front of the car. So the division can be helpful. But the division can also be harmful. You have a great solution, which is to listen collectively without headphones. That way, everyone knows what’s happening, and everyone either agrees to listen or disagrees and we talk about it. I sometimes put on kids podcasts or econ podcasts on the car audio — we negotiate over the subject of the day — and it’s a better experience overall. You’ve got me thinking. Great comment!! Hey Defo, great blog! Congrats!!! It is not a bad thing for kids to be in the playground with only a minimum of parental attention. Some people would say that we lost something important from the days they would go by themselves and play outside without supervision. When we were young we would play by ourselves while our parents read the newspaper, socialized with friends, or watched TV. We actually enjoyed the opportunity to be in our own worlds without their constant intrusion. And by observing them we learned what it meant to be an adult who knew how to enjoy their leisure time. Your are fine, the kids are fine. Listen to your podcasts, it can only make you a better dad! My uncle likes to say that his third kid didn’t ask for any attention because he didn’t know what it was. There’s definitely a declining ability to provide attention with multiple kids. 100% for kid 1, 50% for kid 2, 33% for kid 3, and so on (source: The Sibling Effect). Maybe it’s even lower. With that framework, there might be an argument that the marginal unit of attention is *even greater* for multiple kids and also for younger kids who have to fight harder for it. If I were one of 8 kids, I sure would fight like hell for any attention from my parents, because it would be worth a lot. Still, I think you’re right that *engagement and attention* is overrated insofar as it has an impact on outcomes or personality or interaction with the world. To me, it’s more about the present, are we missing too much by being distracted, or are we not missing very much? It’s a tough question. Definitely past generations of parents dealt with *different* kinds of distractions, like the ones you pointed out. Our new technology provides an interesting wrinkle, perhaps, but it’s an age-old question. Thanks for the great thoughts and for reading! 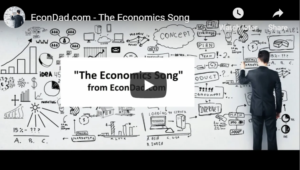 Take care and let me know if you ever want to post a guest article as a fellow Econ Dad!